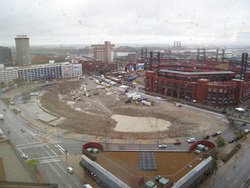 Ballpark Village to Ballpark "tillage"
The eyesore next to the new Busch Stadium in downtown St. Louis was supposed to be Ballpark Village, an ambitious, downtown-changing development of restaurants, bars and luxury condominiums. But as the 2010 baseball season begins, it’s still just a swath of scorched earth, evidence of another wealthy corporation’s broken promise. Ballpark Village has devolved into ballpark “pillage.” And if the history of redevelopment pledges in downtown St. Louis holds true [specifically, Kiel Auditorium, almost 20 years of nothing–and counting], we can expect to see that chain-link fence and veneer of grass at Ballpark Pillage for decades to come. Here’s an alternative: Turn the “Ballpark Village” site into a vertical farm, and be the first city in the U.S. to bring this innovative concept to life. What’s a vertical farm? It’s exactly what it sounds like: a high-rise greenhouse, with a farm on every floor. It uses advanced, soil-free technologies to grow crops, and because its footprint is vastly smaller than that of a tradition farm, it’s perfectly suited for small plots of land in urban areas. That idea is catching on among urban planners, proponents of the local-foods movement, agricultural experts, and climate-change scientists. Vertical-farming technology developed by El-Paso, Texas-based Valcent Inc., was cited by Time Magazine as one of its Top 50 Best Innovations of 2009. A small-scale design of a vertical farm for downtown Seattle won a regional green-building contest in 2007. And the U.K.’s Paignton Zoo is making high-tech horticultural history by creating a small vertical farm to grow food for its animals. To date, however, no American city has jumped into vertical farming. So, why not St. Louis? A vertical farm in the heart of downtown St. Louis could be the visionary, transformational development that city residents, boosters, planners and politicians have hoped for since the last game-changer—the Busch Stadium doughnut—opened in 1966, on the exact same spot where Ballpark “Pillage” sits idle today. Having the first large-scale vertical farm could revitalize urban life in St. Louis. Architectural renderings of vertical farms reveal buildings that—because they promote growth by capturing passive sunlight—feature completely transparent walls and ceilings, making them potentially eye-catching, graceful additions to the cityscape. Such an iconic structure in St. Louis could bring thousands of visitors—both to look and to learn. It would put St. Louis in the vanguard of a new technology, and help to jump-start a revolution in urban agriculture. St. Louis’ impressive horticultural resume already includes the Danforth Plant Science Center, the Missouri Botanical Garden and Monsanto world headquarters. This city is well-positioned to lead in this arena. How about it? Let’s get vertical.